For the new year, during the winter time, who has not yet made good resolutions for the body and who may be seeking some heat ????? If you’ve found the Temazcal, this is what you need. In short it opens the heart naturally leading us to heal our bodies and our relationships. It relaxes the mind and frees us from stress. 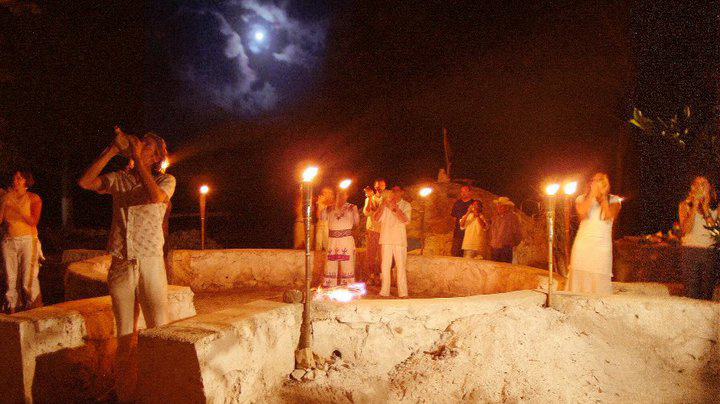 If you are looking for a more authentic trip and away from the beaten paths and want to get to know this part of the Mayan culture, this ceremony is for you! The Temazcal is a pre-Hispanic tradition, which can be found in all the Americas in different forms. Here in Mexico, and in the Mayan culture, it is a kind of stone hut, igloo-shaped, where we will bring incandescent volcanic stones at each stage (or “door”). There may be more than 50 stones depending on the duration and intensity that is desired; it goes without saying that the more hot stones, the more intense the heat will be. As the body reaches its limit, the mind is free. The hot stones are sprinkled with water in which there are some medicinal plants that have many beneficial properties for the body. At sunset, before entering the Temazcal, there’s the fire ceremony leader, or “temazcalero” (Sort of shaman fire man) that asks to different elements for permission to conduct the ceremony. This tour is from Playa del Carmen or Tulum,, and can last for about 3 hours, from 5 to 8 p.m. The ceremony is given in the Mayan language and Spanish, but our guide speaksFrench and is specialized in these energy techniques that will provide you the sense of it all. For those who have done or will do our day “Tierra maya”you will see a glimpse of the Temazcal Mayan community, just to give you an idea of what it is.